It’s time to look at a Final Fantasy title. I wasn’t a huge fan of the previous Crystal Chronicles title that I played so I was a little worried when I first realized that I had the next installment. I watched the trailer and quickly changed my tune though since this one actually looked pretty solid and promising. Fortunately it lived up to the trailer and is actually a spin-off that you can be proud of. You don’t need to have played the first one to get into this title since Crystal Bearers takes place 1000 years after the first. Additionally the first game didn’t really have a conventional plot so you weren’t gonna miss much either way. The plot follows a kid named Layle who is a Bearer. This means that he has special abilities (In this case Telekinesis) and is also built to be a lot more durable than the average human. There are only a few Bearers left since humanity hunted them down and they don’t get along with the humans. Layle is a mercenary who takes whatever job he and his partner are given. At first this is a simple task but on one protection mission he is attacked by a mysterious robot. This robot is a part of the Yuke tribe which was eradicated years ago. She wishes to bring them back and Layle isn’t even sure if that is a bad thing. The government definitely doesn’t want that though since it would mean conceding power and territory. Either way both sides need the 3 legendary jewels to meet their objectives so regardless Layle is tasked with obtaining them. He will have to outwit a mischievous Selkie in order to do so though. Once he gets the jewels, who should Layle give them to? I thought the game did a good job of making the plot engaging right from the start. The opening cutscene is a lot of fun and gives more action than the entirety of the last game. This title has fun with the motion controls and uses them for a bunch of different mini game style levels. You could be sure to find many different gameplay styles which always kept the game fresh. Naturally I still prefer traditional controls to motion based anytime but this one was definitely smoother than many others that I’ve tried. The graphics are pretty solid. The characters appear to be on point and the energy effects look good. The hub world is nice and bright and makes for a pretty good forest kind of landscape. It’s not going to go down as the best looking Wii game but is definitely solid enough to be noted. As for the soundtrack, it is mostly low key, but we do get two hype boss battle themes. I’d also say that the soundtrack never feels dull outside of the hub world so it definitely works well. The game is reasonably long at around 10 hours. It may not sound all that big for a Final Fantasy type game, but I did skip all of the enemies and certainly didn’t get any powerful equipment. I actually didn’t buy anything at all since naturally I didn’t have enough money for anything good. It did feel satisfying though to just coast through the game at the equivalent of level 1. The reason why this is feasible is because aside from the initial tutorial enemy mob he rest are all completely optional. Aside from them there are only two bosses. That will be the most difficult obstacle to overcome and it will take you many lives but the bosses keep whatever damage you dealt so eventually you will find a way to claim victory. As per Final Fantasy tradition the final boss does suddenly become rather high tier and cosmic. It’s always a nice treat to get a flashy climax like that as not only does it make the game more memorable in the long run, but it’s always fun to have a space battle like that. It’s good that Layle was so powerful since he could take it in stride. It’s also a fun change of pace to be the overpowered character for a change. You’ll notice right away that he seems a lot stronger than the rest of the cast and you’d be right. By the end only one character can actually give him a real fight and even then Layle still has the edge. The only real flaw that the game has is the map. It’s one of those maps that is really zoomed out the whole time so you never truly know where you are. Honestly I still fail to see the point of it in general since it certainly won’t be helping you get to your objective. You will likely end up wasting some extra time during these moments but stick with it and you’ll be just fine. Of course when the map is the only serious issue that you have you know that the game is quite solid. The controls may not be amazing but they get the job done. To use your TK abilities you have to point at the screen and then twist the remote in the direction you want to throw someone. This does allow the TK abilities to be a little more intricate than someone like Silver, but I’d certainly be cool with just having one button be what activated the power. Then based on what you press next is where you will throw them. There are also racing levels where you will really want to make sure you turn effectively. The toughest mini game is certainly the one where you have to help the heroine win a game if volleyball though. Those bullies were tough! I didn’t really touch on the characters so let’s look at the big ones. I didn’t trust Layle’s friend the whole time since you just got the feeling that he would end up being a traitor. Well, it didn’t happen so I have to say that he was quite good. He risked his career for Layle and even held his own against a Crystal user. The guy is often out of the loop but still helps out whenever he can. The Selkie is a nice character to have around as well since she always provides a lot of witty banter. She may not have powers but she gets by well enough with her wits. You almost feel bad for her by the end since she is searching for someone who doesn’t care to be found. That’ll probably feel like a big let down. I can’t say that the main villain was all that inspired but he isn’t bad. At worst he is just rather generic and doesn’t stand out as much as the others. His abilities are definitely very good though and the guy is persistent. He is absolutely not backing down without a fight. The Princess felt like a waste in comparison though so nothing really needs to be sad about her. She didn’t add anything to the story. Layle was a fun character as expected. He’s definitely not the nicest chap around but he is certainly very direct and to the point. Layle knows that he is ultra strong and just rolls with it. Nobody ever pushes him around and he only does what he wants to do. He’s certainly not your average main character and that’s a good thing. This guy’s definitely got quite a lot of personality to him. I certainly found him to be a more engaging character than the mysterious Yuke. He will end up going down as one of the more likable Final Fantasy leads alongside Cloud and Lightning. Overall, Crystal Bearers was a lot of fun. It’s definitely the kind of game that is certainly going to age very well long term. While the map is a bit of a hindrance at least you have the moogles who do their best to put you back on the right path to victory. The gameplay is fun and the story is on point so you really can’t ask for much more than that. You certainly don’t need to be a Final Fantasy fan to enjoy this game and I’d recommend it to any platforming fan. Even though I played without beating any enemies I would probably recommend beating a few just to stay on the safe side. That final boss is no joke. 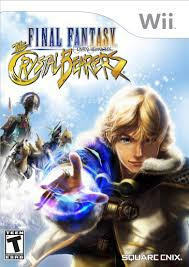 This entry was posted in 8 Star Games, Game Reviews, Games, Reviews and tagged Crystal Bearer, Final Fantasy, Final Fantasy Crystal Bearers, Game Review, Nintendo, Platformer, Review, RPG, Square Enix, Video Game Review, Wii by dreager1. Bookmark the permalink. Yeah, Final Fantasy is a lot of fun!